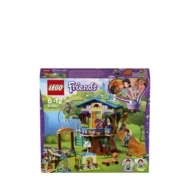 - Includes Mia and Daniel mini-doll figures, plus Mimì the bunny and Cinnamon the bird figures. - Features a tree house accessed by ladder or scramble net, attic with opening roof and storage box, tree trunk with storage box and a bunny house. - Accessory elements include a skateboard, water gun, torch, ghost stories book, artwork tiles, pizza, ‘I love Heartlake City' mug, board game, map of Heartlake City Park, boomerang, love letter tile, ball, bird nest, egg and a carrot. - Whizz down the zip wire and then scramble back up the net to the tree house. - Prepare an exciting night in for Mia’s friends with ghost stories by torchlight, board games and pizza, then discover Daniel’s box of belongings in the attic! - Take the skateboard for a spin in Heartlake City Park, or have fun outside the tree house with the sports equipment with this great construction toy. 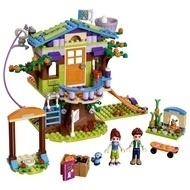 - Help animal-lover Mia look after her pet bunny in her house and the cute little bird nesting in the tree. - Tree house measures over 6” (16cm) high, 6” (17cm) wide and 6” (16cm) deep. - Bunny house measures over 1” (3cm) high, 1” (4cm) wide and 1” (3cm) deep.